How intellectual property makes literature. This month, 100 years ago in Cardiff, one of the world’s greatest writers of children’s fiction was born. Roald Dahl’s children’s books make his readers laugh, they have a joyous vivacity and they have found a place in our collective identity. Dahl was an individualistic writer who created his own conventions. He was a literary inventor, indeed, one of the three film scripts he wrote, ‘Chitty Chitty Bang Bang’ features an inventor ‘Caractacus Pots’, creator of the famous flying car. Today, our language is strewn with neologisms and re-definitions coined by Dahl. Who hasn’t felt like an Oompa-Loompa, trudging off to work? Even the name ‘Willy Wonka’ has become a means of describing the dangerous and astonishing facets of an inventive personality. 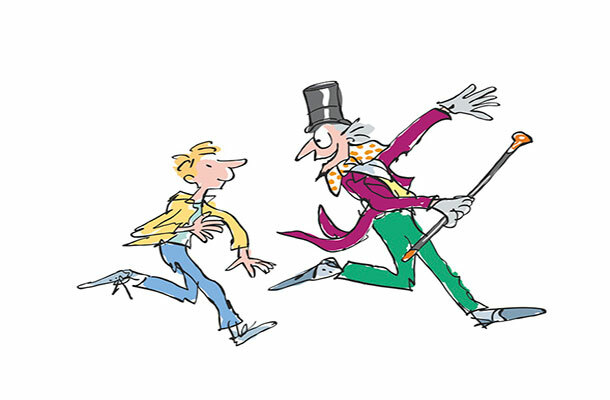 Mr Wonka and Charlie - Images courtesy of The Roald Dahl Literary Estate © Quentin Blake. Dahl didn’t merely colonise our language with new words like ‘snozzcumber’, ‘gnozzle’, ‘grunion’ and ‘gnosh’, he also captured old ones. The term ‘golden ticket’, although it existed before Charlie found one with his Wonka Bar, is now almost universally associated with Charlie’s astonishing rags to riches good fortune. ‘Human beans’, the Big Friendly Giant’s collective noun for us, is far more memorable a name than our ‘true’ scientific label ‘homo sapiens’. 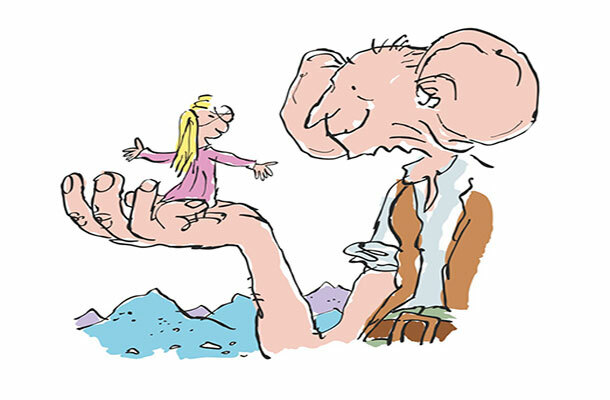 BFG - Images courtesy of The Roald Dahl Literary Estate © Quentin Blake. Dahl’s inventiveness doesn’t just characterise his approach to language. His stories for children and adults are suffused with the creative reasoning of an inventor. His work is characterised by a love of unexpected consequences and a desire to create something new with them. The classic tales he wrote for children are not mere flights of fancy, they are quests for phantasmagorical utility. Dahl wasn’t just a Fantastic Mr Fox drafting Tales of The Unexpected in a fug of cigarette smoke in his famous writing a shed in Great Missenden, Buckinghamshire. He was a ‘real’ inventor. US Patent number 3233610 describes the Wade-Dahl-Till valve, developed by Roald Dahl, hydraulic engineer Stanley Wade and neurosurgeon, Kenneth Till. Roald’s son, Theo developed hydrocephalus after being struck by a car, the valve draining fluid from his brain kept blocking. The new invention was Dahl’s answer to the problem. Although Theo recovered before the invention could be put into production it is estimated that over 3000 patients benefited from the Wade-Dahl-Till valve. 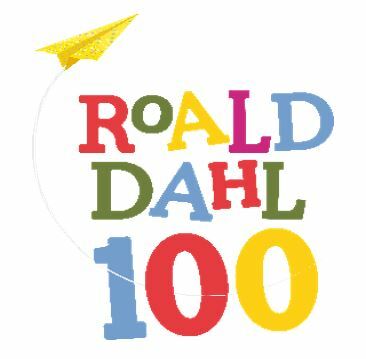 Although he was known as a writer of fiction for adults, Dahl’s first big hit with young readers came in 1961. ‘James and the Giant Peach’ was published by US publisher Alfred A. Knopf, Inc., and illustrated by Nancy Ekholm Burkert. Three years later Knopf published Charlie and the Chocolate factory, this time illustrated by Joseph Schindelman. Dahl established himself as a popular, irreverent, children’s writer. However, it wasn’t until 1979 and the publication of The Enormous Crocodile, by Jonathan Cape, when Dahl was 63, that a new creative element was added to Dahl’s work. 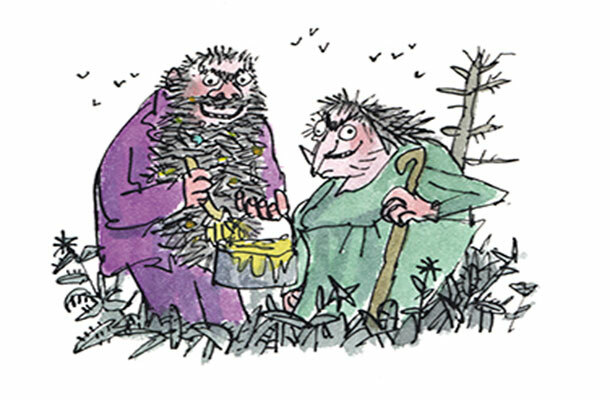 The Twits - Images courtesy of The Roald Dahl Literary Estate © Quentin Blake. Quentin Blake, brought his own, witty, charming and subversive visual style to the words of Roald Dahl. The partnership was productive and the work flowed: The Twits (1980), George’s Marvellous Medicine (1981), The Big Friendly Giant (1982) and The Witches (1983) followed in rapid succession. In 1995, five years after Dahl’s death, Quentin Blake illustrations of Dahl’s earlier works were published by Puffin books. Today Roald Dahl’s words and Quentin Blake’s images are part of global culture. Luck (good and bad), inventiveness and, in the linking of Dahl and Blake, wisdom, are crucial elements of the success story. Tom Maschler, then editorial director of Jonathan Cape, described his decision to team up Dahl and Blake as, ‘a piece of matchmaking of which I am especially proud.’ The brand he created through this combination is global, it has longevity and it is suffused with a mischievous collective identity. Images courtesy of The Roald Dahl Literary Estate © Quentin Blake.